Scheduled public tours take place every Wednesday and Sunday from May to September. We keep the groups small with an average 3-5 travelers per guide. Private tours can be organized any time for 4 or more people in the group and they are available daily, please consult us for a price. Private tours are picked up from their accommodation. Our public tour is not suitable for neither children below 12 when sharing a double kayak with an adult or below 16 using a single kayak. There is no age limit for private tours. No kayaking experience is required. 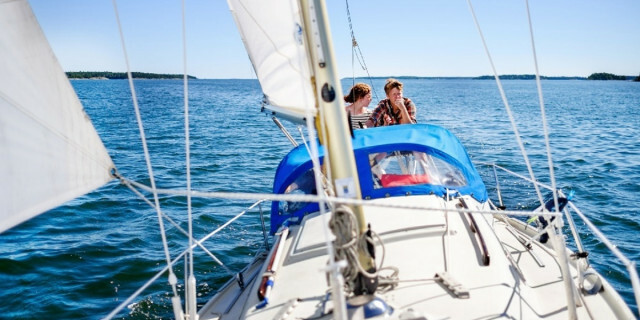 We will give you the basics and our guides will make sure that you feel safe and comfortable. 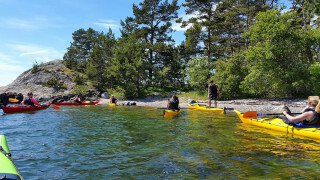 We start at 9:00 a.m. and return around 5:00 p.m.
Sea kayaking involves physical motion, so reasonable physical fitness is required. The main language is English, but Dutch and French guides are available on request. You want to have clothing that dries up quickly, so avoid cotton if possible and choose polyesters and synthetics (often in athletic clothing). How to get there: from central Stockholm, take any green metro line heading South. Get out at metro stop 'Gullmarsplan'. The meeting point is located at the square when you come out of the metro. Travel time: Gullmarsplan is located 4 stops South of tourist center 'Gamla Stan' and 5 stops from central metro station 'T-Centralen'. Travel time by metro is 10 minutes from 'T-centralen' and 9 minutes from 'Gamla Stan'. Departures every 2/3 minutes. 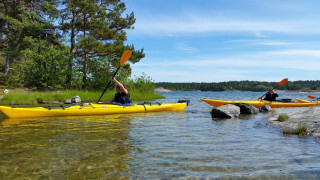 Paddle in and out of the natural wonders of the Stockholm Archipelago in this kayaking journey. 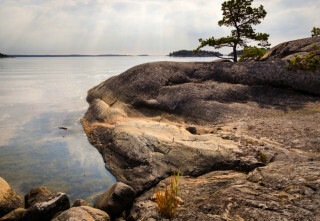 From the water, you explore the area of 30,000 islands, some inhabited and some left alone to Mother Nature. 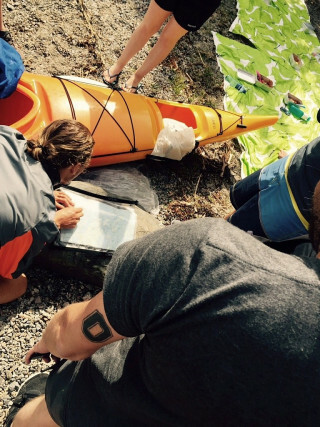 Enjoy the scenery, learn, and have fun paddling for a hands-on experience! 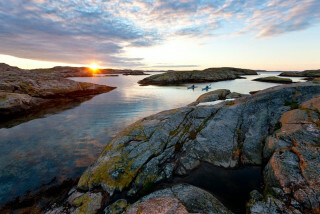 We pick you up in the morning and drive you out to the archipelago. 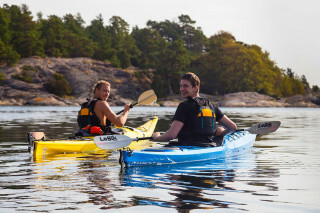 Here you will get a short introduction to kayaking based on your skill level. Don’t worry if you haven’t been paddling before, no previous experience is required. 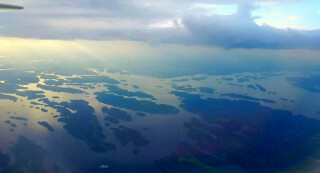 We then head straight into the natural paradise of Stockholm. 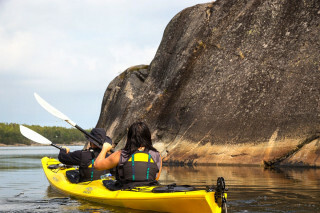 Depending on the route, you might paddle past dense forests, a historical fortress, “ghost islands,” or high cliffs towering over the water. The islands are as diverse as they are beautiful. Keep your eyes open the rich bird life, such as wild swans, geese, eider, loons, arctic terns or great cormorants. We may also spot a sea eagle or two. And with some luck, some seals may swim up to say hello! When we get tired, a private island waits for us to relax and enjoy a tasty lunch. 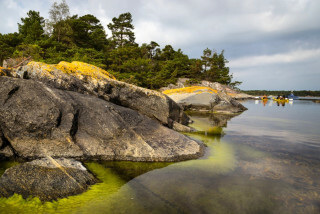 Enjoy the sun from the beach or dip into the cool waters of the Baltic Sea. After the break, we continue paddling through the many small islands to explore and admire their beauty. 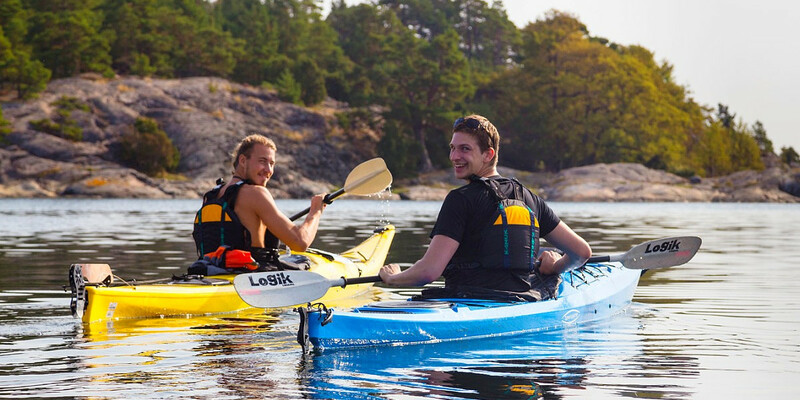 Later we tie our kayaks together to enjoy a traditional Swedish “fika” of coffee and pastries. 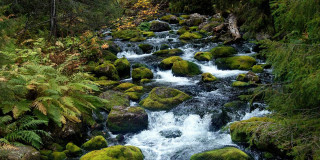 We simply float down the stream, share teatime, and soak in the atmosphere. At the end of the day, we finish back at our meeting point. 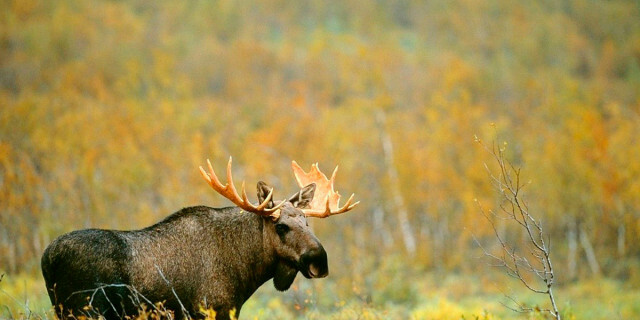 This trip lets you experience Swedish nature like no one else. Your Stockholm memories will last a lifetime, but your sore arms should be gone in a few days.